Last week I was lucky enough to attend the DotMed (Or .Med) conference in Dublin. It was billed as a “Festival of the Future of Medicine” but also cleverly had content related to the humanities. To be honest, I went for the techtalk. It was only afterwards when I looked at the event as a whole did I figure out the benefits of keeping it all human (see also: the latest Daft Punk record). The event had ideas and concepts which fell into that category of “this is obvious, but if it’s so obvious, why didn’t I think of it.” I’m going to talk about one of those ideas now. Doctors can’t just consume any more, they also have to create, cultivate and converse. 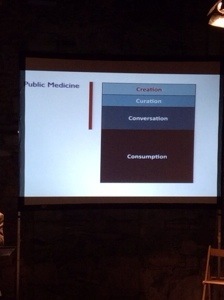 This came as part of a talk by Dr Bryan Vartabedian (@Doctor_V ) when he discussed the concept of The Public Doctor. The paradigm of the doctor consuming knowledge in order to become (and remain) a learned medic isn’t enough any more. If you’re going to be part of it, you have to get involved. This hit home quite hard for me. I had been to a talk by Mike Cadogan (@sandnsurf ) at the ICEM 2012 conference 18 months earlier that touched upon the same issues. I came away from that talk thinking “Maybe I should remove my Twitter pseudonym and start a blog…” I was now being told the same thing again, but still I had reservations. Thankfully a slide came up which told me that if something scared you, it was probably worth doing. I have been contributing online in forums for about 15 years now. Newsgroups, message boards, fan sites, Reddit, and, in the last few years, Twitter. 10,000+ tweets, 600+ followers. I know my way around online. However, I am from the last generation of doctors to have started med school without the internet, I think I’m programmed to believe that medicine should be separate to all that online, “fun” stuff. DotMed made a point of bringing things together. By having a conference which bounced between serious medical talks to art appreciation to patient stories to banjo playing, the whole thing felt like my Twitter feed come to life. So I changed my Twitter account so that it would show my real name. Then I dusted down an old WordPress registration and got to work assembling some kind of blog, and here it is. I have called it Emergency Medicine, et cetera, or E.M. etc. for short. Or shorter still: emetc. The main idea is to end the notional separation I still maintain between medicine and the other things that interest me, namely technology, e-health, social media, arts, popular culture and music. One hand washes the other, so to speak, and I will do my best to write about these things on this blog. You don’t have to be a doctor to read this blog, but it might help. I realise there’s a lot of blogging around these days, and we live in an age where the most precious commodity is someone’s attention. I hope that by talking about what interests me, you might be interested too.